Relief Is In The Stretch is the first book to distinguish the nine common causes of low back pain, to teach you how to identify them, and to describe appropriate yoga poses to relieve each one of them. 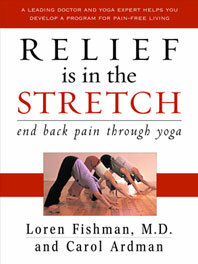 Dr. Loren M. Fishman, a specialist in rehabilitation medicine who has been using yoga in his medical practice for thirty years, studied yoga in India for a year with B. K. S. Iyengar and is an internationally recognized expert in research and clinical treatment of sciatica and low back pain. This book helps you determine how to start your own yoga practice or alter your existing practice, depending on the severity and chronicity of your pain, and on your physical condition. The postures in this guide, each one illustrated by a photograph, target specific sources of pain--from arthritis to spinal stenosis, from pregnancy to sacroiliac joint derangement--and demonstrate how you can manage, reduce, and ultimately end your pain.